Trevor Asche and Matt Salyer of Versailles, Indiana, show off a pair of 24-inch gator trout they caught simultaneously Aug. 31 while fishing with Capt. Danny Stasny of Southernaire Fishing Charters. 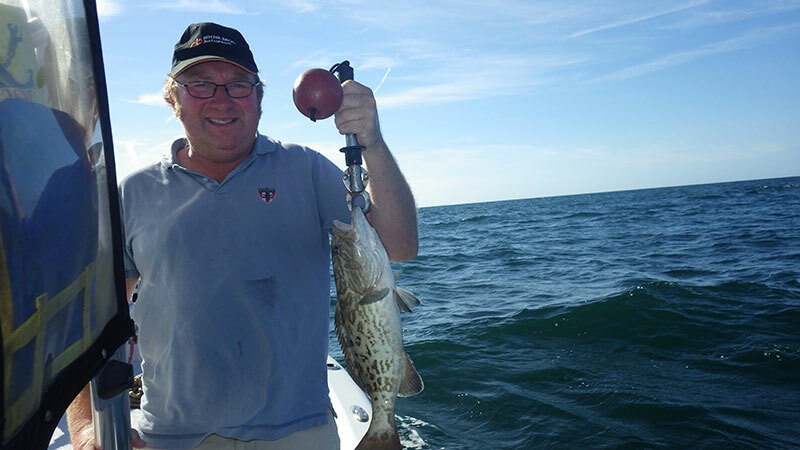 Jim Butler of Anna Maria and the United Kingdom shows off one of numerous catch/release gag and red grouper caught Aug. 27 on live shiners while on a charter fishing trip with his family and Capt. Warren Girle. The stench of red tide still looms in some backwater areas around Anna Maria Island, but fishing remains consistently good in southern Tampa Bay. Spanish mackerel, mangrove snapper, redfish, pompano, spotted seatrout and snook can be found in their refuge from red tide in southern Tampa Bay at the north end of Anna Maria Island. 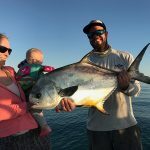 Red tide can ruin a day of fishing if you don’t look ahead, but it also can trigger some of the best fishing of the season. The fish fleeing red tide are packing into areas where the water is fresh and clean. And the more fish in the area, the better your chances of catching one. It just makes good sense. Another thing about the fishing during an outbreak of red tide is you never know what to expect. I’m finding fish where I would never expect them. Random schools of pompano and schools of redfish are popping up from nowhere. I’ve stumbled across a grass flat loaded with trout, where normally I’d only catch a couple. What I’m getting at is: Although there is red tide, don’t be discouraged. Find clean water, think outside the box and there’s a good chance you’ll be rewarded. Also, as of Aug. 30, the FWC had called timeout on snook and redfish. Catch-and-release will be practiced from the waters south of Bean Point and Emerson Point south to Collier County. And, as far as I can tell from the maps, this includes the Manatee River. 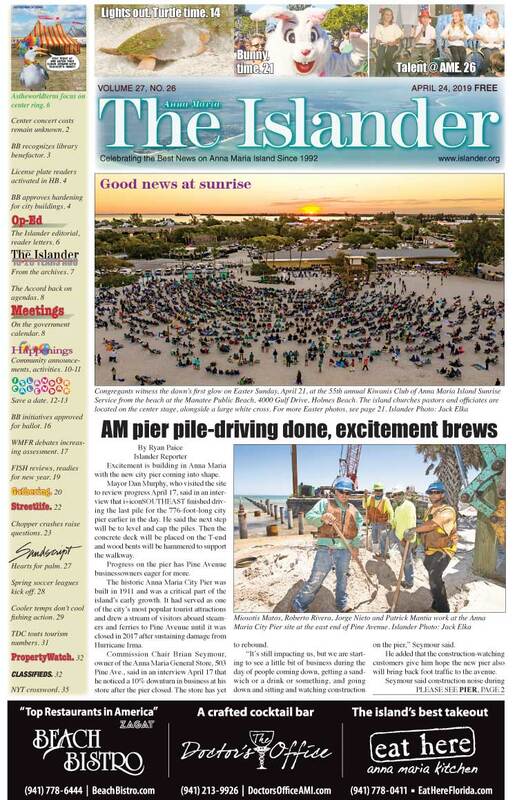 The order made necessary by the deadly effect of red tide will be revisited Sept. 26. Lastly, my excursions on the water with Southernaire are proving to be quite good. I’m finding redfish around docks and sandbars in decent numbers. Most catches are slot-size fish. Catch-and-release snook are being found in these areas, as well as along the mangrove edges. Most of the snook are 22-26 inches. Mangrove snapper are readily coming to the hook, a bite that’s handy for folks who want to catch fish for dinner. Again, docks and deeper flats are producing good numbers. Spanish mackerel are rounding out the bite for my clients. Fishing structure is producing epic mackerel sessions. On some days, its every bait, every cast. Capt. Rick Gross of Fishy Business Charters is working on the flats of southern Tampa Bay to avoid red tide. In areas where the water is clean, Gross is putting clients on redfish, trout and catch-and-release snook. According to Gross, fishing live shiners under a Cajun Thunder popping cork is providing nonstop action. He’s finding large concentrations of fish gathering in areas where water is clean. Slot redfish — now catch-and-release — and trout are the norm. Sport fishers are being rewarded with snook up to 28 inches on the hook. Capt. 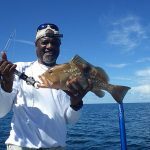 David White of Anna Maria Charters is fishing offshore for a variety of species. Finding clean water is a must and, once found, fishing is quite good. Mangrove snapper, hogfish, Key West grunts and groupers are being taken with ease. Spanish mackerel also are in the mix. Moving inshore, White is targeting redfish, trout and snook throughout the flats of southern Tampa Bay. Fishing structure in the bay is resulting in mackerel bites. Capt. Jason Stock is working offshore in depths of 40-60 feet where no red tide is found. 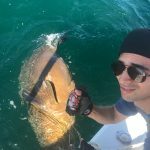 In these areas, where ledges and reefs exist, Stock is finding permit, cobia and mangrove snapper, as well as goliath grouper and barracuda. Moving inshore, Stock is in pursuit of the tarpon that have taken up residence in southern Tampa Bay. Stock says they’re taking living offerings and artificials. Capt. Aaron Lowman is running offshore to the ledges and artificial reefs with depths of 35-50 feet of water, where he’s putting clients on mangrove snapper, hogfish, porgies and gag grouper. He said mackerel also are present, especially around the reefs. Moving inshore, Lowman is finding spotted seatrout, redfish and snook where water is clean. Fishing grass flats and docks is yielding a good bite for his anglers. Jim Malfese at the Rod & Reel Pier says fishing is “day-to-day.” There are days when patches of red tide move into the area, which spoils the bite for the day. On days when the water is clean, catch-and-release snook are being observed — and some are being caught, too. Mangrove snapper are a favorite at the R&R, where they are being hooked with regularity. Flounder and Key West grunts also are going in the coolers. Capt. Warren Girle is fishing clean water offshore in the Gulf of Mexico. In depths of 40-55 feet, Girle is putting clients on juvenile red and gag grouper. Fishing over the ledges is producing mangrove snapper, Key West grunts and porgies for his anglers. Moving inshore, Girle is working the flats of Tampa Bay with good results. 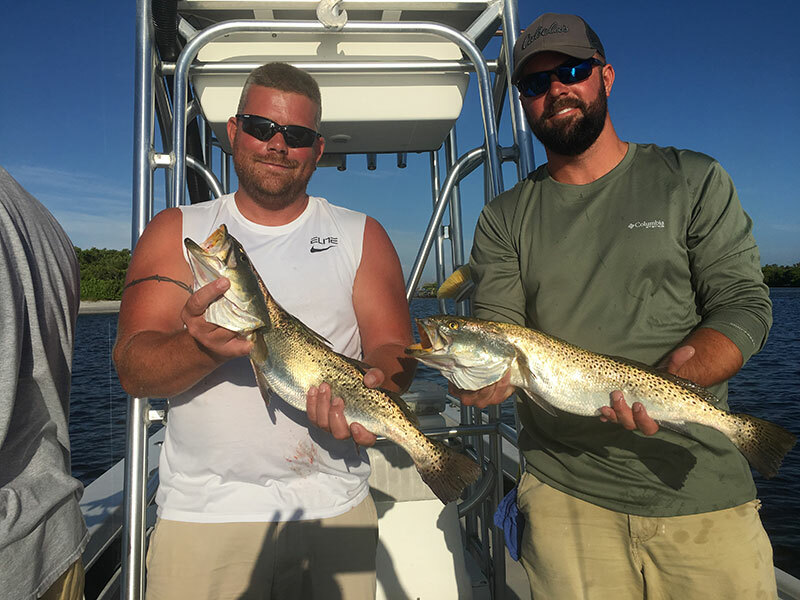 Spotted seatrout and catch-and-release redfish and snook are being caught with regularity in the shallow waters, while fishing structure in Tampa Bay is yielding macks and mangrove snapper for Girle’s clients.